Pearson IT Certification carries a full line of Cisco Press products. Cisco Press is the official publisher for Cisco certification and network technology self-study resources, providing candidates with flexible learning options including books, eBooks, practice tests, video training, simulator software, and value-priced libraries. 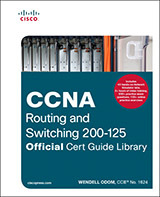 On May 17, Cisco announced updates to the CCENT and CCNA Routing and Switching certifications. The changes reflect the evolving job market and the latest Cisco technology. The CCENT certification remains the prerequisite certification for the CCNA Routing and Switching, CCNA Security, and CCNA Wireless certifications. CCENT ICND1 100-105 Exam Prep LiveLessons gives you the edge you need to prepare for exam success. Wendell Odom, best-selling author of the CCENT and CCNA Official Cert Guides, provides more than eight hours of video training detailing what to expect on the exam, common misunderstandings, and more than three hours of sample question review. This is an essential course for anyone interested in passing the CCENT ICND1 exam. Job Role: The CCENT and CCNA Routing and Switching certifications validate comprehensive network troubleshooting and implementation skills required for job titles such as Network Administrator, Network Engineer or Network Specialist. Recertification: These are 3-year certification programs. You can recertify by taking any associate-level exam or professional-level exam or higher. Or you can take the CCIE certification exam before your certification expires. Sign up for promotional mailings today to be among the first to hear about new releases, certification announcements, podcasts, and special offers from Pearson IT Certification.